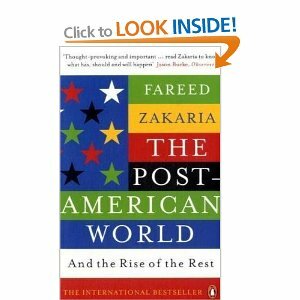 I recommend Fareed Zakaria's book to anyone yearning for a macro perspective on shifts in global power at work in the recent past, today and in the near future. His no nonsense analysis focuses on the rise of two of 'the rest', India and China, with some well researched detours into the decline of Britain and failures for China to develop in earlier times. Zakaria (he is the editor of Newsweek) nicely contrasts the way in which China has been able to grow in a continuous spurt, thanks to a powerful centre, such that there will be increasing political power and influence by stealth, whereas India, dominated by regionalist democracy, will play the role of the third power, but more in economic terms than political. Even since the book was published, we are seeing signs of this, with the growing reach of the Chinese navy in the past few weeks. The book is also excellent at helping us to understand modernisation and distinguishing it from westernisation. What is happening in India (the rise of the IPL for instance) and China (the glitz of the Olympics for instance) are not examples of westernisation, rather, they are signs of a certain level of development within capitalism. The consumerism we associate with malls in London or Los Angeles has acquired a local flavour in Mumbai or Dubai. Zakaria is interestingly confident that when per capita GDP rises above US$5000 per annum, forms of liberal democracy start to take emerge in any society. In that respect, the fraying at the regional edges we have seen in China of late may be the first signs of a revolution away from command and control centrism. "America is a large and diverse country with a real inequality problem." "America is creating the first universal nation, made up of all colors, races and creeds, living and working together in considerable harmony." Which version is it to be Fareed? The dream or the reality? From what we are seeing in Arizona, it looks like the dream is gone. Like the UK twenty years ago, America is losing its industrial base. However, the move to a services based economy (what alternative is there?) is much more risky than it was in the 1980s, precisely because of the rise of the rest: massively increasing global competitiveness. As China and India invest more heavily in tertiary education and improving their business environments, innovation will gradually shift eastwards. When universities in Beijing or Chennai develop the research depth and resources that many of the top US universities have (as they will in the next few decades), America will have no competitive advantage left. Fred! Where have you been all my life! How is the perfume and how are the guns? America remains the most open society to immigrants. Thats Americas strength. Immigration constantly refreshes the pool of talent. America is not perfect, but at least you know what you are up against as opposed to the patronizing nonsense in Europe. Tons of friends in liberal Europe still trying to break through the glass ceiling. When Europe elects its first minority Head of State, then you can spout this inanity you just shared. It is true that America has gained such a competitive edge because of immigration. I work as a software engineer in a US company, and despite the fact that it costs our company more money (not to talk of the services of immigration lawyers), our engineer base is more than 50% foreign (mainly Indian & Chinese and a few Nigerians like me). On a side-note, with a workforce of thousands of engineers, it is sad that there are only a handful of black engineers amongst them. The science and technology sector make a nation; it fuels innovation, guides the manufacturing sector, actually creates things and not just magically conjure up virtual money from other people's money like the financial sector. However, most Americans are afraid of science & math. Back in UNN Nsukka, every guy wanted to do Engineering.. over here it is usually relegated to nerds. From high-school it is determined that to be cool, one mustn't excel in science and math! Ironically, since blacks are seen as the "coolest" people here, they are the least represented in the field. I agree with Fareed because I wonder what would happen to American innovation drivers when the economic disparity between the West and the East closes. The main thing driving the good kind of immigration to the US will cease to be a factor. Also, with rising wealth in the East, they already have the advantage of a large population! If China had close to the GDP per capita the US had, its economy would eclipse the US and, staying true to capitalism, many local chinese companies would become powerhouses in their sectors because they will have a command of the largest consumer market! My only relief comes from the fact that when the East has grown to something close to the West, they will be demand for cheap labor again, and then it'd be Africa's turn to build cheap plastic crap for the rest of the world until it can grow its standard of living. Globalization might actually be the world's great equalizer!!! !